(From Nikon lens literature) Compact, lightweight and packed with an array of advanced features, the AF-S DX VR Zoom-Nikkor lens offers 18-200mm f/3.5-5.6G IF-ED focal range length and 11.1x zoom coupled with Nikon ED glass, Silent Wave Motor and enhanced Vibration Reduction (VR II). The VR II feature enables significantly sharper handheld images at slower shutter speeds and in a wider range of lighting conditions than previous models. Equipped with this new lens, users can take pictures at shutter speeds up to four stops slower than is possible with a non-VR lens. The combination of the VR II technology, the 11x zoom feature and the focal length range--equivalent to a 27mm-300mm lens in 35mm format--means the AF-S DX VR Zoom-Nikkor is an ideal total package for dedicated amateurs and professionals alike. Nikon's second generation VR technology offers users two modes to match different shooting conditions. First, the VR Normal Mode, which compensates for camera shake and includes automatic panning detection, as well as automatic tripod detection. And second, VR Active Mode, which compensates for pronounced or regular vibration, for example when shooting from a moving vehicle. Like all AF-S Nikkors, the AF-S DX VR Zoom-Nikkor 18-200mm f/3.5-5.6G IF-ED features the compact Silent Wave Motor which enables high-speed autofocus that is not only extremely accurate but also super quiet, making it ideal for wildlife photography. In addition, the new lens has a minimum focus distance of 0.5m applicable to the entire zoom range. Note - the blur results for this lens have now been updated using our micro focus bracketing protocol (450 test shots, 1350 total analyses performed), to eliminate the effect of our D2x's slight backfocusing with this lens. This is Nikon's version of the 18-200mm "vacation lens", so-called because it's a great choice for those situations when you only want to pack along a single lens, to cover a wide range of shooting conditions. It competes against lower-cost, non-VR models from Sigma and Tamron. Like its competitors, this is a reduced image-circle lens, designed for use on cameras with APS-C sized sensors. Because of this, it's quite light and compact relative to its exceptional zoom range. An old expression says that there's never a free lunch, and this is especially true with lenses. In the case of the Nikon 18-200, the tradeoffs are somewhat soft corners at maximum aperture and medium focal lengths and somewhat high geometric distortion across a range of focal lengths. The good news is that the center of the frame is generally pretty sharp, the corner softness improves rapidly as you move away from the corners, and stopping down by one or two f-stops significantly improves corner sharpness. Center sharpness when stopped down to f/8 is excellent at shorter focal lengths, but the image as a whole softens slightly at focal lengths of 100mm and above. As I take care to point out in my test analyses for the other "vacation" lenses, it's important to consider this lens' intended market and its very affordable price point (for a lens incorporating image stabilization) when calculating the bottom line for it. Can you do better with multiple, more expensive lenses? Unquestionably. But if space and convenience are primary concerns, softer corners at maximum aperture may be an acceptable price to pay. Possibly even more important than the sheer convenience factor though, is the security of not having to worry about dust entering your camera body as you swap lenses on and off in less-than-clean-room environments. - This is actually a fairly serious issue with digital SLRs, as dust on the sensor will show up in every shot you take, and your ability to clean your camera's sensor is likely to be severely limited while traveling. At the end of the day, the third-party competitors to the Nikon 18-200mm f/3.5-5.6 VR are a fair bit less expensive, but lack Nikon's excellent vibration reduction technology. - This is an important feature, particularly with lenses having smaller maximum apertures that will more often force you to use slower shutter speeds. The Nikon 18-200mm also appears to be somewhat superior optically to its third-party competitors, but we need to repeat our tests of the Sigma and Tamron lenses using our micro-bracketing of focus to make sure that what we saw in those optics wasn't the result of focus errors in the D2x body. (Stay tuned, we still have the Sigma 18-200mm here, so should be able to retest it fairly soon. We have to ask Tamron for another sample of their 18-200mm to re-test.) The Nikon 18-200 also feels better built and more rugged in the hand than either of the other two, although we have no objective way of assessing long-term reliability for the lenses we test. Is the combination of VR and nice build quality worth the roughly $400 differential in street price for the Nikon 18-200VR? That's ultimately a question for each user to ask, based on their available budget. Personally, I view VR as so essential that I'd gladly save my pennies for the Nikon 18-200mm. If you're on a limited budget though, the ability to buy two third-party lenses for the cost of this single Nikkor optic could be a strong argument in favor of the third-party models. NOTE: We've now posted a test of the Tamron 18-250mm f/3.5-6.3 Di II LD Aspherical IF Macro AF. The 18-250mm's review compares and contrasts that lens with the other long-ratio zooms on the market, making it a good point of reference if you're shopping for a lens of this type. Check it out! Convenient, good quality at f8. I shoot mainly landscapes in good light. So having read many reviews stating that f8 is the sweet spot for this lens, 90% of the time shoot in A priority at f8. And I get pretty good results. If you tinker with the charts here you will see why. at f8 it's pretty acceptable for sharpness across the range. Set it and forget it. But if you want to shoot wide open, just forget it. For how I have used it, it's been fine, but it won't serve more creative uses at wide apertures. The above double personality is perhaps why you get differing views on this lens. When used stopped down, is plenty sharp enough for many uses. In my case, with my copy, it had lens creep... the lens would creep out to its full extension under its own weight while strapped to my neck... banging into things while being carried. I exchanged my VR1 for the VR2. If it wasn't for the lens creep, I would have kept it... The lenses are identical except for this feature, and I hear, not all copies creep. This is NOT a good lens. Don't buy into the DX hype of this lens. IT is cheaply made, plastic distortion barrel. Cheap glass..and truly way over priced. Distortion rains supreme with this lens. A murky 18 and cloudy 200. Even their own Nikkor 35mm 1.8 out performs this plastic blunder. The lens also creeps..which was suppose to be fixed with VR2. I was truly disappointed with how slow the lens is...how loud the lens is..and how it truly performed. A major let down. The only thing was great about this lens was I unloaded quickly..and got my money back. There are Nikon People out there who sing its praises. And even Reviewers who claim it is great. Never listen to them. They are wrong. Trust me..this lens and along with the VR2 version belong in the trash can. If you expect dull...and lifeless photography..pick this lens. IF you want crystal clear...sharp images..pick another lens. This plastic blunder is Nikon's worst production. The 18-200/VR has a very convenient and flexible zoom range in a reasonably compact package. Until recently, VR wasn't readily found in competing superzoom lenses from Sigma, Tamron, and Canon, so Nikon had an advantage here for a while. The phrase "jack of all trades, master of none" mentioned by another poster seems rather apt. A bit soft in the corners at the wide end and gets soft at the long end, but this is about par for the course when it comes to superzooms. The biggest problem i have with the image quality is the ugly bokeh (defocused background). It is really quite edgy and nervous -- to the point where it is distracting in prints. I used to use this lens for weddings when i don't want to bring my "big rig" pro-sized gear due to the flexible zoom range, but found that the bokeh sometimes is so bad that it ruins the shot. I have taken to blurring the backgrounds in Photoshop to smooth out the bokeh, but this is obviously inconvenient and tedious. Mechanically, the lens seems fine at first until you use it over time. After a few months, the zoom ring loosens so that you have zoom creep. If the lens is pointed down (as it would if you have your camera hanging from your neck), the lens will zoom and extend automatically. That's actually the lesser problem. After a couple years, the auto-focus motor started slipping. Now the AF motor gets stuck and clicks, not being able to change focus unless i move the focus ring and help it out a bit. It has been getting worse to the point where i the AF barely works without clicking now, and i will have to send it into service. Bottom line: this superzoom seems like it was designed and built with a number of compromises in image quality and build quality in order to keep it from being too expensive. If i had to do it again, i would get a 16-85/VR instead. I have used one of these lenses off and on over the last 4 years on a variety of Nikon bodies, and a Fuji S5. I have also, when I have been unhappy with what I have produced, tried a Tamron 17-50, Nikon 17-55, Nikon 18-70, and Nikon 18-135, all of which have fallen short of perfection in some way or other. To be honest 90% per cent of what I thought I wasnt seeing was probably down to me and poor technique. I have over this period of time also noted the Photographic press have a slightly snooty attitude to so called " Superzooms" in general , of course writing about lenses isnt quite the same as putting your hand in your pocket and paying for them with your hard earned cash. I am also rather baffled with the pre-occupation of a large number of what are clearly Hobby Photographers lusting after fast 2>8 Zooms of varying lengths costing as much as a passable second hand car! The lenses once acquired will in most cases never be used anywhere near their intended limits, be far in excess of an amateurs needs , and beyond improving fitness levels due to their weight, be largely wasted. Each to his own of course! To illustrate the point, I recently attended an Airshow and met up with a friend who was doing both days. On day 1 he had used his 70-200 VR and on day 2, for a rest, his wifes 18-200. He was amazed at the quality of the shots he was getting with this humble consumer lens, so much so that he half jokingly remarked that he could have saved a fair bit of sweating on what had been a hot first day. The point is, Nikon dont make any bad lenses these days, your choice is degrees of excellence. The most significant thing this lens has in its favour is of course VR. This, to my mind , is one of the truly significant real steps forward with modern lenses. Handholding a 200mm lens is now truly viable. Lugging clumsy tripods around is largely history. The fact is that for most of us who are not working pros in need of something special to impress clients, this humble much maligned lens will exceed your expectations by some margin and probably be all you will need for 90% of all the shots you are likely to take. It is , all round, the best of its genre, and testament to the skill and common sense of Nikon , who are primarily after all a Lens manufacturer. This lens alone has led more Photographers into the Nikon line than any other that I can recall. Its minuses and plusses are well documented in other reviews. All I can add is that I wont be parting with mine for a while yet. As a post script, I have just borrowed a 17-55 2.8 from a friend and run a few varied shots from both lenses through as JPEGS, using the same processing parameters for both lenses. I asked the owner of the 17-55, a semi-pro, to identify the prints made with his lens. He couldnt, and neither could I, without sneaking a look at the marking I had put on the back of the prints. Food for thought isnt it. In August, 2008, I bought a D60 kit from BestBuy that included the extra 55-200 mm lens. My wife and I then headed out on a month-long trip from Florida to Yellowstone. After just a few days, I got tired of switching lenses and missing shots. I guess I had gotten spoiled by my sony H1 ultra-zoom. But with it, I kept missing shots because it was too slow, hence I bought the D60. During one evening, I started looking on the internet for something different. On Ken Rockwells site, I saw his review of this lens. I then found a sale that BestBuy was holding that week, but I had to get to Rapid City, SD to find a BestBuy. Once there, I purchased one and it was the best purchase I made for my camera. It made my photo-taking experiences completely different. If fact, I haven't taken it off the camera yet even after taking thousands of pictures. Considering that I am using it as a tourist camera and lens, it takes great pictures. Other than the con I mentioned above, one other is when the camera is hanging from strap, the lens will completely extend if not fully collapsed first. It seems to stay put when you shut it down to 18mm and will stay put until you zoom with it. 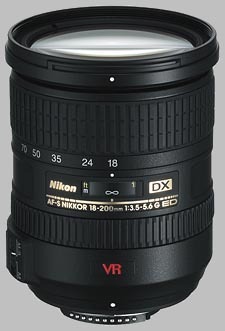 If you are looking for an ultra-zoom version of a DSLR camera, A Nikon with this lens cannot be beat. My wife leaves this on all the time - lets her avoid changing lenses (an issue in dusty outdoors environments). It does a good job over a wide range and has VR. You WILL notice distortions at the wide end in an urban environment where you have lots of lines. Not an issue in the 'outdoors'. Don't expect perfection and be happy with all it does. If you want better IQ, pair the 16-85 with the 70-300. You'll get better images over a wider range - but will have to swap lenses. Flexibility, efficient VR, good optical quality when stopped down. Quite good optical quality when stopped down a bit, fast and precise AF, efficient VR. At it weekest point, 200 mm at f/5.6, it is still usable for portraits, but not great for good quality landscapes. The distorsion, quite disturbing at 18 mm, can completely be corrected with DxO Pro. It is not expensive at all, considering what it delivers. SWM , exceptional flare resistance, sharp at 200mm, not much CA to worry about. bad barrel distortion , soft at 18mm . for a super zoom , it is exceptionally sharp , my copy beats my AF-S17-55f2.8 DX at 55mm , but the pro zoom is much sharper at 18mm. I also compared it to the Tamron 17-50f2.8 and Sigma 17-70DC , suprisingly though, this lens was not much worse then all others , the Tamorn was the sharpest of all in this zoom range group but with serious CA issue, the Sigma came very close second , the AF-S16-85VR was the next , the AF-S17-55f2.8DX was the last. Now move on to tele range of it , I compared this lens at 200 mm and 135mm against 3 lenses , Nikon Af-S70-300VR , Canon EF70-200f4LISUSM , Canon EF70-300DOISUSM. The Canon L was the easily the sharpest of all my lenses , with the Canon 60macro and Nikon AF-S200f2VR, but the AF-S18-200Vr was not at all bad , it was a bit sharper than I thought it would be at 200 mm , it was a bit softer than the AF-S70-300VR at the same focal range but not much. Oh , I almost forgot to write about this , I also tested the Sigma 18-200OS at 200 mm and Tamorn 18-270VC at 200 mm agaist this one and of course the Canon EF-S18-200IS. All in all, the Nikon one is the best super zoom of all these 4 , though as SLR says , it is a bit less sharp than the Tamorn and Canon. This Nikon 18-200VR's got better flare resistance ,lesser CA and better color-contrast than all other super zooms I have compared it to, combined it with its excellent SWM and FTM , it is a winner although I sold it for the new 50f1.4G and 85f1.8D(cause I love a small prime more than a big zoom). I think as I get a bit of money in next month , I will re-buy it for my D80 and I will sell the Canon eF-S18-200IS ,which is a too heavy lens for a this kind of super convinient zoom. I like the Canon zoom lock sytem , but it is a bit too big. And I can not FTM it although it AF fast enough for almost anything I shoot including a running dog. So , I highly recommend this lens and the Tamorn 18-270VC over the Canon eF-S18-200IS and Sigma 18-200OS. Oh , if you want to get it , just get it as a part of a D90 kit or D300 kit like me , you will save a lot of money. It's a super-zoom so it needs f8 to perform adequately at the tele end. For non-critical work it's great but if you are fussy the quality will disappoint. After using this lens for about 6 months, I recently sold it. Though it is very versatile, and remits you from lens changing if not for an ultrawide or supertele, I was just never that impressed by it's image quality. Essentially, by using this lens, you are transforming your DSLR into a bridge camera with better high ISO performance. The lens is only marginally sharper than that of my Fuji E900 point and shoot, but with more CA and distortion. This is perhaps the ultimate lens for "get the shot" people, or those who take what I'd call documentation pictures. Between the large zoom ratio, very effective VR, and the high ISO performance of a good Nikon (or Fuji) DSLR, there should be almost no excuse for missing the shot (other than mediocre AF performance at the long end). For me, it is not worth the trouble and risk of taking a DSLR if only to take documentation pictures of an event of place that is not particularly interesting. I would just as soon sacrifice a few percent of image quality and simplify my life with a good P&S. Then spend on lenses that allow more creativity via higher image quality, larger aperture, more extreme focal lengths, etc. It really blows my mind to think that people were paying $1000 and up for this lens, just a year or two ago. The build quality is less than I'd expect for the $600 that I paid for it, let alone over 50% more. For this cost, I'd expect a lens that feels extremely well made, but this lens is merely average in that regard. In the end, this lens is a jack of most trades, master of none. For those who'd rather not miss a shot than exploit what their DSLR is truly capable of, there is no current substitute. ...let's just say this lens is of average sharpness even at F8, but otherwise it's a very good lens, with excellent VR and minimal reflection problems. Most of the time it is ok but there will be times when it simply isn't sharp enough even at F8 for a good shot at, say, 21" diagonal. ...it's not as sharp as a Tamron 18-250 and doesn't have the range, either. It does have good VR and that will count for about a stop as the sun drops below the horizon, and up to 4 stops at 200mm. I regularly shoot mine handheld at 1/15 or so at 200mm, at night. It's adequately-sharp and focuses well and it's stable in low light...pretty hard to beat for an "all-rounder". It's just not sharp or long enough during the day or fast enough at night, for every shot that you will want to take, so don't buy this thinking that you will be "set for life" with it. It's a good "starter lens", and, generally, it and one or two other lenses (depending on what they are) will fit in your bag with your DSLR, and make a good travel-kit. I would at least get the Tamron 18-250 for sharp day shots and save this one for short to midrange work in "less than perfect" light or that lucky long-range low-light handheld shot. The Tamron is smaller, lighter and almost half the price. Oh and did I mention that it's sharper and longer? ...eh, I was so impressed with the Tamron 18-250 even without IS that I took a look at my bag, which I had at one point stuffed with the 18-200VRII, the 70-300VR and the 80-400VR and the Tamron 18-250...yes, they all fit in a bag, along with the D300...I just looked at that insanity and traded the D300 and the 80-400 for a Canon5D and the Tamron 28-300VC, then sold the rest. Made a tidy profit. And now I don't have to run DxO at all. ...this is still a decent lens except that it has significant geometric distortion at wid-angle and a lot of blur around 130mm on the lens. I took a lot of good shots with it, though. But I can say the same about my old Sigma 18-200DC OS. This was far better but still not really good enough. There's simply no other comparable alternative. The Sigma OS just doesn't have as good a quality, and it's ever slower to boot. So...if you want a single lens to do it all, this is really all there is. And there are definitely times when I need that (like, say, at the beach), times when I don't want to change lenses. It's great for that, but it's not great. I much prefer my fast glass to this in most situations. It's a nice enough lens, though, a very nice range to have coverage on, and I would definitely recommend it as a primary lens to the novice or a secondary lens for the enthusiast. Sharpness, wide zoom range, VR performance. This is my lens of choice for all-around shooting on my D200. The performance of the VR system is excellent. The sharpness is more than acceptable, and I love the wide zoom range. Lens distortion is easily corrected in Photoshop CS2 or CS3. I am extremely unhappy with the way this lens creeps. I sometimes use a short piece of gaffer tape to hold the focal length. Otherwise, lens construction quality is excellent, but Nikon really dropped the ball by allowing this lens to creep so readily. Can't complain. My 1st Nikkor lens to match the newly acquired D40 (though I settled for the Kit 18-55mm II lens that came with the D40 as well). Image quality is good to excellent. Build quality of the lens could be better, when zooming back from 200mm to 18mm. On 90% of my outings, this is the lens of my choice. I wanted to throw my two cents in here so as to hopefully help people know what this lens is and isn't. What it is not is a pro piece of glass that will give amazing sharpness. I think a lot of people have established unrealistic expectations of this lens, which is unfair to say the least. Now, this lens is a great all-in-one walkaround type lens. You get consistently sharp(yes, sharp. Just not as sharp as the pro lenses) images throughout the zoom. The VR makes this lens usable in a number of circumstances without need for a tripod. The only place this lens can get in trouble is if you need a fast shutter speed in lower light...no VR can help that. So if you want one lens that can stay on the camera most of the time and do an excellent job of making images, then buy this lens. If you want razor sharp images for fine art work, save your pennies and buy the faster 2.8 zooms. I bought this lens in August 06 and have taken over 2,000 pictures with it. As you get older, like me, you discover that your hands are not as steady as when you were younger. Accordingly, the image stabilization in low light is worth it's weight in gold to get good pictures at slow shutter exposures. I am able to hold the camera at 1/30 sec using the IS and get good pictures without flash! This is really great for we old duffers who don't like carrying around tripods or other stabilizing equipment. Unless you are an absolute perfectionist, you will be very satisfied with the pictures you get from this lens. At a price of about $750, there is simply nothing else on the market, even from other camera manufactures, which provides this flexibility and quality in equipment and pictures with IS. Sigma is suppose to be manufacturing an OS lens but it has not been released as of this review. Don't hesitate to buy this lens and try it. If you don't like it, it is easy to sell on e-bay for about what you paid for it if not more. After all I have read of this lens I really thought it would be something special... it's not. I wasn't planning a review of this lens as I returned mine, but I thought a reality check might be in order for those contemplating this as I did, due to all the glowing press. Yes it has the kind of zoom range where it could be the only lens you use, and it is good throughout its focal range, but it is far from great optically. I see a lot of "tens" here and am wondering what they could possibly be comparing it to to justify a perfect score. I find my 28-200G to be sharper and have better CA control, and my 50mm and 105mm primes blew it away. Although this is a good "all in one" lens, it is not without compromises, especially at this price point. Many will do better to cover this lens' focal range with several other zooms/primes if optical quality is paramount. To me this is the main advantage of having a SLR. But with that said, this lens is a major achievement for those that just don't want to be bothered swapping glass and/or lugging a tripod, and is capable of good results under a wide variety of conditions. And while I found the VR to work well, I am afraid it did not offer me much else so I saw little reason to keep it. For the price and versatility, this is an excellent lens. It is perfect for travel and general walk-around photography. It does leave some to be desired though. The build quality is not great. Beside from the zoom creep, my barrel has a disturbing amount of play when fully extended. No matter how solid your tripod is, I'm afraid this can introduce some shake in gusty winds. Could be sharper though software such as Raw Developer corrects the sharpness. I have had great luck using this lens in a wide variety of situations. Recently, I got very good results in a low light, no flash situation. The unsharpened file at http://www.ccsc.k12.in.us/~jay/low_light.jpg was taken at 1/8 sec, f5.6, 200 mm. I like to have a very sharp image, so I sharpen the nef images with Raw Developer before printing. This lens is a great choice to keep on your lens. Necer able to shoot hand held at 1/10 This lens can do it. Just shot this last night. http://i68.photobucket.com/albums/i18/alldigital/DSC_5379.jpg Raw image at 200MM ISO 1600, 1/13 sec f 5.6. No post processing just conversion from RAW to JPG. Just think what a bit of PP can do. I only had this lens for about a week. I was thrilled when it came. The range, VR, and AF-S had me immediately, but in use, I found the autofocus slower and louder (kinda scratchy) than my 18-70, distortion higher than 18-70, sharpness lower than 18-70. Needless to say, I stuck with my 18-70. I enjoyed the 18-200, but it didn't seem that much better (range and VR were nice) than my tried and true workhorse. This one got sent back. The range, VR, weight, and decent build are all commendable though, and this lens would be great for any Nikon DSLR user. As a travel lens, it’s perfect. It's by far the best 18-200 out there currently (Dec 2006). It would be all you needed for general shooting. Even though I returned mine, I recommend it to anyone looking for a good wide to tele lens. I purchased this lens to take aerial photos. I am shooting from a helicopter which has some vibration. The VR has worked well smoothing things out. Great range, good build quality,VR, It rarely leaves my camera. Zoom won't stay put when tilted. What can I say that others have not. This is just a great carry around lens. I use it almost all the time. I wish it was better in low light situations, but that is just being picky. For the price, there is not much to match it, in my opinion. This is a very handy and compact lens. This is a very handy lens to have. I haven't taken the lens off my D200 since I got it in July. It's replaced my 28-80 and 70-300 Nikkor lenses. It's has also been close enough to my Sigma 12-24mm that I haven't had to change to my Sigma very often. The lens is great for shooting in low light scenarios where the objects are stationary, but not the best when shooting moving objects. Lens is subject to "lens creep" which can be annoying. This lens deserves well its success - in its category, it definitely is one of the bests !!! Indeed, as a travel companion, this lens will be the perfect choice for 99% of the shots, covering everything from moderate wide angle to telephoto - and results are great !! Of course, there are some design trade offs, resulting in various aberrations (distortion, color fringing,...); but if what you want are great pictures in any conditions, go for it !! This lens, like all the consumer zooms I guess, performs well when you operate it in its sweet spot. This lens is quite good in 24-50mm optically, in the belief that distortion can be easily fixed by PTLens. The 24mm focal length is undoubtedly the best optically due to the benefit of negligible distortion. The constrast and sharpness fall noticeablly in the longer end, however, it still ok. Lastly, according to the review of slrgear.com, at 18mm the quality improves when stop down from f3.5 to f4+. On the other hand, this lens can just as well be used as one wishes. The range and VR really gives one wings.... I mean make one feel free in most cases. This is good and bad, though. Good for the convenience and bad for sharpening one's skills because it can make one not to think. However, I think this lens has the capability to grow with one's techniques, and it has an unique combination of strengths that easily outweigh its shortcomings. Good walk-around lens. Covers 95% of needed focal lengths. Great low-light shots. Slight darkness around outer edges of photos. While I will say this is the most useful lens I have in my bag, it's not the Lens of all Lenses Nikon made it out to be. I will say that this was in part from my lack of understanding how the VR would work in real world shooting. It is absolutely superb for shooting in low light scenarios where the objects are stationary, but not that great if you are shooting moving objects. In cases like that you are better off with a nice fast f/2.8 zoom. For shooting sports, I just turn the VR off and use it like a normal lens and go with shutter priority. I would certainly buy this lens again, but I would not pay the $1000 plus that some are asking for it. This lens is on my camera 90% of the time. The lens has its faults, which have been described in other reviews, but it is a lens that you can carry around all day and have great results at the end of the day. For me it’s a trade-off of super sharp, but heavy lenses vs. giving up a bit of sharpness for a lot less weight to lug around. If I need the sharpness or the extra speed I will use the 70-200 f2.8 otherwise the 18-200 is on the camera. I bought this lens together with my D200 as a kit. The D200 is my first dSLR - I had used a Sony F717 previously and use an old CanonAE-1 from time to time. I really enjoy the zoom range of the lens and find that the VR works very well, but I was disappointed by the speed of the lens and the fact that there was so much lens extension with zoom. Many people had complained of lens creep - my lens did not exhibit this at first, but over time I found that lens creep began to set in as the lens components loosened up. The images I've taken with this lens have been a mixed bag. In good light, I find I can get decent images of my daughter with decent bokeh, but I was also disappointed by the lens' apparent softness. The images just did not seem very sharp. At first I thought it was my technique that was at fault, but my 50mm 1.4 exhibits much sharper images as did my old Sony. I guess it is unfair to compare a prime to a zoom lens though. All-in-all, I think it's a good lens for its intended purposes. As far as recommendations go, I really think it would depend on what would be expected of the camera. If you're looking for tack-sharp images and speed, then no. If you're looking for a decent all-around lens that you can leave on your camera much of the time, then yes. I have bought two of these lenses - the second one because I thought the first one may have been defective. I was wrong. The second one was just as bad. At the long end, this lens is NOT sharp, and why buy an 18-200 if the 200 is not useful? VR works just fine, but it did not help in low light situations. I waited months on two waiting lists for these lenses, and was sorely disappointed. Both lenses have been sold and I am now looking ahead for something new. Excellent travel and stay-on lens. It has distortion and vignetting as noted by other reviewers, all correctable with Bibble or photoshop. It will also get all those photos you missed changing lenses. I got an elusive 2am raccoon using this lens! The VR II performs as advertised. It is an excellent first lens while learning the joys of DSLR photography. Highly recommended. I finally saved up the bucks to get a good DSLR and lens. I picked the Nikon D200 with the AF-S 18-200 G VR because both the camera and lens were getting very good reviews and it's a lot of bang for the buck. I since picked up a few more lens, but my primary points of comparison are to the Canon S1 IS which I've used for the last two - three years and a 35 mm Canon A-1 prior to that (which I used for a good fifteen years at least.) Having IS on the Canon point and shoot was a bit of an eye opener and made me decide that spending more to get VR was worth the extra bucks. The 18-200 on a D200 is a mind boggling experience and reminds my of getting a 28 - 105 zoom for my Canon A-1 many years ago except that now I've got very fast autofocus, anti-shake and a much larger focal range. Aside from a tendency to creep (or gravitate) this lens has very little to complain about (and quite honestly my 28 - 105 zoom did the same thing so this is not a new problem). I have not used an equivalent lens by Sigma, Tamron or Canon, so I have no basis for comparison of products. However, the 18- 200 provides sharp, contrasty, colorful (I hate to say saturated it doesn't enhance the colors, but it doesn't dull them by any means) photos. There is some barrel distortion at the wide end, but it's easy to correct in the PC. It's difficult to get the lens to flare (I have put the sun in the photo trying to get flare for effect and been disappointed!) and CA is very minimal (I have seen some but only when I went pixel peeking at very high zoom) and would not be seen in average prints. Both the 50 mm and Macro 105 I own are capable of making sharper images that the 18 - 200 set at the same focal length, but the difference is small. Quite frankly, I can say with all confidence that the biggest problems getting good images with this camera/lens combination is ME, and that's exactly what I was hoping for when I bought it. I just decided to move up from a point and shoot, and so I bought this lens with my D80 as a kit lens of sorts. Wow, was I in for a surprise. Because of the AF-S motor, the zoom is very fast and quiet. The focal length is very convenient, and is great for a first-time lens. And it's SHARP. I was blown away by the sharpness of the first pictures I took with this lens. The only issue I have with this lens is (a very slight bit of) zoom creep. Also, even though it is smaller and lighter than lenses like the Nikon 17-35 F2.8, I think that it is a little heavy and big, but that does give it a sturdy feel. Overall, it's a great lens, and it will probably stay on my camera 90% of the time. This is the walk-around lens I have been wanting for years! In film days, I used the 24-50 mm zoom for this purpose. I foolishly sold it and got a 20-35, which I never used. I almost never take the 18-200 off my D200, as all of my photography is in the 27-300 mm focal range. I find this lens is excellent for close-up work, except for the rare very, very close macro shot. VR works really well and I get an addditional 4 stops from this lens. I doubt that I would ever buy another lens without this feature, I like it so much. It does use up some extra battery power, though. Sharpness is excellent, too, and I am making 24" x 36" prints for my walls. My only (minor) gripe is that the lens barrel creeps up/down at the longer focal lengths, when the camera is pointed up/down. Bottom line: if you own Nikon DSLRs, this lens is a must! This is a fantastic lens from Nikon. And based on the scarcity of this lens, it appears that a whole lot of people in the Nikon world agree. If I had to choose just one lens to go for everyday shooting, this is the lens I'd take. The 18-200mm range allows versatility and the VR II image stabilization system really helps. At $700 list, it's not a cheap lens but I consider it a great deal considering what it delivers. The only downsides in my book are the scarcity of this lens. I had to wait weeks to get my copy but the wait was definitely worth it. Also, this is a DX lens so if you use a film camera body, this lens will produce pictures with severe vignetting. Overall, a very nice lens from Nikon that I would highly recommend. This is a great evry day lens. I have it mounted on a D80 and have to say it takes the vast majority of my shots. The longer reach combined with the VR is a great boon. The VR absolutely works. I'd say it's good for at least three stops. As for construction, there's a definite price you pay for VR & compact, and it is spelled c-r-e-e-p. Man, what a pain. The lens will not hold its zoom position at all if tilted down. Well- Here I am several years later and I'm just sick of this lens. It just doesn't seem to focus any more and the creep is worse. I've changed my review as I can't honestly recommend somethingthat won't hold up. A 'do it all' lens that's best suited for those who upgrade from a compact digicam, but can be useful for a more advanced photographer on those long hikes. I have been using Sigma 18-200 before the Nikon 18-200VR came out in the market. After taking a plunge with scarce reviews that I could find on the Internet in March 2006, I decided to buy this one. Here in Australia I was lucky to order online with digitalcity.net.au and get the delivery the second day in the month of March 2006. No issues at all and with excellent service. And if it did not suit me then I decided that it would go on ebay. (Though, the one to go on ebay was the Sigma 18-200 after using the Nikon 18-200VR). I got mine made in Japan. Sharpness excellent: if you were to look at the final prints of A4 size from this lens compared to prints from 50mm prime; no one can tell the difference. There are a few draw backs as: vignetting, distortion but nothing that can not be corrected in post processing, if required whilist shooting architecture. If you shoot otherwise under normal field conditions the distortion is hardly noticible. Sharpness is better than Sigma 18-200 and the 18-70 Nikon. The only time I now use 18-70 Nikon is when I am certain to use built-in camera flash at 18mm to 27mm indoors. Why, there is a flash shadow of this lens at the bottom of the image at that focal range. Else for all other shooting, indoors and out doors 18-200 VR stays on. F8 to f11 is the sharpest. Closest focus is 0.5m. For me this is the best and stays on not forgetting the VR is a bonus and does the job extremely well 3 to 4 f stops. Gone are the days when one really needed an excellent lens to get good photos processed chemically from film rolls. In the age of digital imaging there is virtually nothing that can not be post processed by the software and obtain the desired results. All that is needed is a sharp lens and a good zoom range, 18-200VR does the job well. SAMPLES: All photos here (http://picasaweb.google.com/lalsumeet/PeopleArchitecture) are from this lens and Nikon D50. This is my dream lens. For a very long time I have wanted a sharp zoom lens that covered the focal range from true wide angle to true telephoto with close-up ability and stabilization. After reading a number of reviews (the review here at SLR Gear was particularly helpful) and looking at many pictures I decided this lens would meet my needs. I then bought the D50 so that I could get this lens and also have a relatively compact low weight system that I could carry on my belt (I manage to squeeze camera and lens into my Lowepro TLZ Mini holster case). The reality is that the total is so much more than the sum of the parts. It is absolutely wonderful to be able to grab only my camera and this lens and know that I am ready for virtually any photographic situation. Bottom line I am ecstatic. Here is a link to my user review of this lens. Good range in a lightweight and compact package. Also, VR2 rocks if you like to shoot a lot of handheld stuff. I can get away with 3-4 shutter speed stops slower just as advertised -- although only about 60% of my shots were keepers when shooting like this so my advise is take a few shots doing so. There are some threads over at the dpreview.com forums (nikon slr section) comparing the quality, sharpness, etc. of this lens vs. the 18-70, and several others on a tripod. From that thread, the 18-200 was one of the sharpest at different focal lengths and apertures. I'll spare you the comments about distortion @ 18 mm (all zooms have it), the light fall off/vignetting (more or less correctable while PPing yet still a bit annoying), and the others known issues talked about in other review. My biggest gripe about this lens is its inability to focus and produce a sharp image @ 18-24 mm. I have tried 4 copies now and kept the best one (walking around with $2800 worth of lenses is kinda cool though). In a nutshell, when I focus on a distant object (infinity as per the AF), the image is just not sharp... this is particularly true at 18 mm, but I can do it at 50 as well -- in fact I have compared several shots @ 50 on this lens to more or less the same scene through my 50 f/1.8 prime and can tell them apart. My 18-70 wasn't like this at all. The other major issue I have with it is the fact that it "creeps" -- that is, it zooms in or out by itself depending on the orientation of the camera, but this only occurs at steep angles up or down. I called the Nikon Tech line and asked about the zoom creep on this lens. The tech had a sample 18-200 and his did it (set to 70 and pointed either up or down). He also called their NY office and spoke w/ a manager who tried 2 other 18-200 samples he had and both of them did it. By the way, the technical term for this is "gravitate." Anyway, the official word is that "gravitation" is normal on this lens. It can be a problem if you're on a tripod at steep angles. Wish they would have added a zoom lock on a $700 lens. If others would like to call and verify, I use the Photo and Sport Optics Technical Support at 1-800-645-6687. The final comment I would make about it is that it isn't a true 200 mm lens UNLESS you're focused @ infinity. I believe this has something to do with the IF mechanism. The plus side is that you can focus much closer on objects. Despite these criticisms I would say that overall, I'm still happy with the lens but I wouldn't pay much more than I did for it. If you're thinking about it, don't drop over $700 on it, wait for the pricing to stabilize. I have seen some vendors asking as much as $899 for it which is obscene. ideal when you don't know what kind of lenses your should take before to leave. Your test reflect the default of my 18-200vr, tested also with dxo. So I return the lens to Nikon to confirm this point. Another 18-200vr tested had a better result, so I believe there is a specific problem on my 18-200vr, and may be on your sample to. Very Sharp at the center, Great contrast (better than my 50mm f1.8D), VR sytem works perfectly, Amazing focal lenght, Very Fast Accurate and silent AF, Macro. The VR system is simply amazing. It works perfect and surpasses my expectations. The Autofocus speed is very fast and reliable - I use it mounted on my D50 (unmatched combo IMO). It's the best walkaround lens you can find on the market right now, no doubt on it. The image quality at the center is comparable to any f2.8 Nikon lens, but as I mentioned above, it falls short on the edges....for arquitecture shots I suggest stopping down at f11 for better results (excellent results IMHO). I highly recommend this lens to any Nikon DSRL user. Extreme versitile, VR works well, fast focusing, a real do it all lens! I bought this lens because I don't like to carry a ton of stuff to photograph my kids sports, which varies from indoor basketball, outdoor soccer, tennis, etc. Much to my surpurise, this lens focuses very fast and the VR is VERY effective! When people say it gets them two f stops, that is an under statement! You can read the reviews of this lens on Ken Rockwell's site http://www.kenrockwell.com/nikon/18200.htm Everything he says about the optical characteristics is right on. I highly recommend this lens for anyone who want a great family/travel lens to take great pictures in a vast varity of situations. If you are a techno weenie that worries about the fine points of edge distortion and linearity and other stuff like that then maybe this is not for you. For everyone else, this is a really useful lens for 90% of everyday situations. I was a bit nervous about this lens; it seemed too good to be true, but had to try it. So far, I'm not disappointed. The build quality is excellent; feels solid without being too heavy, and unlike the 24-120 VR, the front section does not wobble. Focus and zoom controls work smoothly, but with enough resistance for precise operation. In my informal testing, the lens performs really excellently in terms of resolution and contrast. At all focal lengths, resolution in the center exceeds what can be recorded by a D2x sensor even wide open. At shorter focal lengths it needs to be closed down 1 stop or so to reach that sharpness. At longer focal lengths it manages to be sharper than the D2x can use across the field, even when wide open. Contrast is relatively high and color rendition is typical Nikon at all focal lengths and apertures, although as with resolution, the corners lose out a bit wide open at shorter focal lengths, but only a very small bit. I will not hesitate to use this lens at any focal length/aperture combination, and expect really excellent results. The VR works extremely well. I can reliably handhold it at 1/4 second at the wide end, and at about 1/30 at the tele end, both at least 3 stops better than without VR. There is a downside, but most people will have no trouble either living with it, or correcting for it. If you take a few shots of buildings with it, you will see immediately what Nikon has traded off for the relatively reasonable price with high sharpness and contrast and VR. The lens has distortion galore. Really obvious barrel distortion at 18mm, with a higher-order component, creating "mustache" (wavy) distortion. this can be removed using the PTlens plugin or Panorama Tools Correct plugin in Photoshop, but cannot be entirely removed with Photoshop's own lens correction filter which corrects only simple distortion, as far as I know. By about 24mm it is almost distortion free, and then somewhat complex pincushion sets in with a vengeance; by 35mm it is pretty bad, stays bad through 70-80mm, and then actually gets less severe at longer focal lengths. I may be making the distortion sound worse than it is; for subjects without straight lines, I will probably seldom bother to correct for it, and for those with straight lines, full correction is easy to accomplish. There is also a moderate amount of red-green chromatic aberration at 18mm with a D2x; this may differ among cameras. It diminishes at longer focal lengths, and is easy to correct for, and not bad enough to make uncorrected images unusable. As with every other complex zoom I have used recently, the effective focal length shortens as you focus closer. At infinity, you really have about 18-200 mm to work with. At a couple of meters, the maximum effective FL is more like 120-130 mm, and at the minimum focusing distance, I would guess it to be ca 80-90, although I have not measured. Image quality stays very high, and there is enough distance between the front of the lens and the subject at minimum focusing distance to allow flash illumination. My measured minimum field is about 60 X 90mm, very good indeed. Another reviewer commented on focusing problems at near-infinity between 18-24mm. I have had the same trouble, and in fact I initially thought the the first wide ratio zoom I tried (a Sigma) was useless because I was getting very blurry results at near-infinity distances. I have discovered by experimentation that with this and other zooms with wideangle ends, the autofocus systems on both the Nikons I use do not do all that well at the shorter focal lengths. My solution is to zoom to a somewhat longer focal length, focus, and zoom back out while holding focus. How necessary this is seems to vary among lenses, but I find I get better and more consistent focus with all of them by doing this. It works for me, anyway. All in all, this is a spectacularly good lens, one most people, me included, will keep on the camera a lot of the time. Image quality can be improved by post-processing, but it isn't really necessary except for architectural subjects.